The Rapier armour is based on our widely used Raptor and 450 Aprons and provides enhanced protection for vital areas. At the request of customers, the length of the Rapier Apron has been increased to cover more of the leg, knee and calf area. The Rapier Apron is 105cm long. As with earlier designs, the Rapier is designed to be used with a full face visor that fits behind the armour collar in the working position. 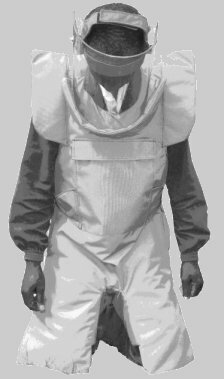 The core of the apron is made of a composite Kevlar/polyamide mix which we have found to be well suited to stopping the environmental fragments encountered in typical AP mine accidents. Fragments of plastic mine casing and environmental debris have been found to weave their way through Kevlar when it is used alone. When layered with closely woven ballistic aramid, its stopping power is improved. With a NATO STANAG 2920 V50 of 450 m/s, the Rapier apron is not guaranteed to resist the metal fragmentation associated with purpose made fragmentation devices. The weight of the apron is 4.5kg (with breastplate fitted) and it is designed so that the weight is carried on the hips. The back is open for ventilation. Flexible ‘wings’ allow greater arm movement while providing more protection for the upper arm and shoulder areas than some other designs. 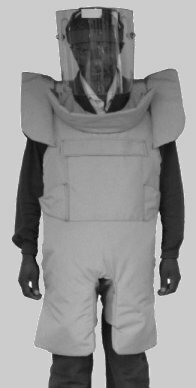 The thigh panels wrap around the deminer forming an open ‘trouser’ whilst a horizontal conical section folds inwards to form an effective genital protector. The cover material is extensively tear and snag resistant and is coated with polyurethane for water repellency. The cover is removable for washing but is also easily cleaned in-situ using a damp cloth. The armour has a V50 of 450 m/s but this increases in the chest area to more than 570 m/s due to a thick polyamide breastplate. The extent of the coverage and protection is shown in the photograph alongside. Order by SDU number - SDU2010.